Learning to float can be a daunting task for many novice swimmers. If you are just starting out or tried it out before and got discouraged because you couldn't get past the floating stage, perhaps the following piece of advice will help you to get over the initial learning curve. Whatever the reason may be, whether you are afraid of falling due to the weightlessness feeling in the water or you are afraid of hitting your head on the bottom of the pool or just the thought of tipping over to your back scares you, without learning to float you cannot continue and enjoy swimming. Learning to float is an absolute necessity in a good learn to swim program, so do not try to skip this step. The more time you spend on learning to float and the better you will get at this will determine your next progress. 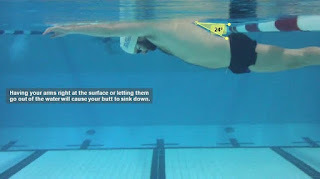 From my previous head and body position posts, you already know that your eyes need to be pointing towards the bottom of the pool and you need to stretch your body into a nice straight line at the surface of the water. However, as simple as this sounds, it is still very difficult for many to get to the relaxed long position. So let me give you a few tips which will ease your transition from standing up to floating, thus setting you up for success. How you start your exercise determines in many cases how well you can do the exercise, so let's focus on what to do with your body before you actually get into the floating position. The main point here is that you need to be flush with the water and ease yourself into the float instead of starting your float from high up and falling into it. Imagine the following, take a tennis ball and drop it into the swimming pool while standing on a chair on the side of the pool. Chances are the tennis ball, driven by gravity, will hit the water and get submerged and then pop back up to surface and then again gets submerged a little less and pop back up to surface. The tennis ball will do this few times until it reaches a calm floating state. Now, instead of dropping the ball from the standing on a chair position, bend down to the pool's edge and nicely place the tennis ball onto the water. Because you were gentle, there is no bopping in and out of the water, the tennis ball just nicely floats without any distractions. A similar concept applies to anything you do in swimming, especially when you are just starting out to learn to float. If you start too high, you will more than likely be sinking and coming back to surface and sinking again, so it is important to eliminate this extra movement from the start. So, next time you are practicing your floats, assuming you are in a shallower water where you can stand up, squat down (bend your knees), so your shoulders are flush with the water. I don't mean, bending forward, just get yourself lower into the water, so your distance from the surface of the water is smaller (like with the tennis ball). The only thing that is sticking out of the water is your head. Your body is still vertical, just lower in the water due to your knee bend. Keep those hands under water. When you are nicely submerged up to your neck in the water, you are basically in a good position to get started. When you first learn to float, you should have your arms extended forward (no elbows bending here please :)), so you add more weight to the front of your body which in turn will make it easier for your legs to float. However, this is where many novices run into trouble as they try to stretch very tensely with their arms forward like they'd be reaching for apples. This causes their body to be rigid and more importantly their arms stick out of the water when they float. So, extend your arms forward and relax them. You can pretend there is a ledge 1/2 foot (~15cm) below the water and you want to rest your palms on that ledge. Let the water support the arms and relax your neck and shoulders. At no point in time should your fingers or hands break the surface of the water, otherwise, you will start slowly sinking. Let's recap, you are close to the surface with your shoulders below the water, your arms are extended forward, yet relaxed and they are below the surface of the water. The only thing that remains is to take a breath, put your face in the water, so your eyes are looking at the bottom of the pool and your entire head is below the water. At this stage, you are ready to give yourself a little gentle push from the bottom of the pool or from the side of the pool and you can float. Note: if you want to blow bubbles, feel free to do so, but I'd suggest trying both variations, with blowing bubbles and without as some folks do not float very well and when they start blowing bubbles, they are getting rid off their floating ability even more :). However, don't be afraid, most of you will float very well as your lungs will keep you on the surface. Applying downward pressure on the arms and upper body. As mentioned above, the major issue here is that your arms should never ever break the surface of the water as it is with a majority of novices which try to float. 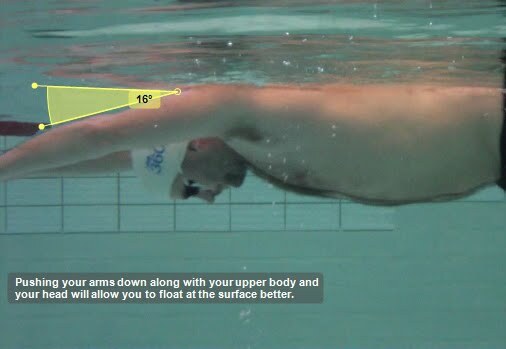 Another way to think about it is that your arms and your body do not actually form a truly straight line, you are pushing your arms a bit down when you float. This is a very bad analogy in terms of our history, but it could work in this sense. Do you remember Hitler's straight arm greeting which was used by Nazis during WWII? If so, then just move the arm from that position another foot (~30cm) up towards the sky and you will have the right position for your arms. Maybe a bit less gloomy analogy is to pretend you are laying on your stomach on a bench (as if you are floating). The bench is about a 1/2 foot (~15cm) high off the ground. Your chin is right at the edge of the bench, eyes looking down and your arms are extended forward and your fingers/palms are touching the ground somewhere in front of the bench as opposed to being a straight line extension of the bench itself. Have fun with it and remember, patience and gentle movements are very important when learning to float. Hey Lance, it ain't that bad, is it? :). Just remember, real men have hair. Hope all is well. I'm facing problem to float. How to breathe with Swimmer's snorkel (front/center mount snorkel)? 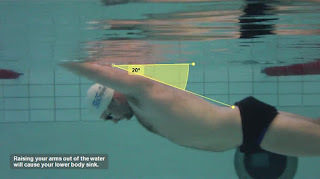 Free Swim Lessons | Starts & Turns | Advertise | Swimming Resources | About | Contact | © 2005-2019 Swimator.com All Rights Reserved.